The newest Meredith Poll surveyed North Carolina voters to measure their satisfaction with the direction of the nation and the state of North Carolina. Voters were also asked about their opinions on political polarization, approval of political figures, the balance of power between the executive and legislative branches, perceptions of discrimination, and comfort level with conflict. The Meredith Poll found that over two thirds of North Carolinians report being dissatisfied with the direction of the country and almost half don't like the direction of the state. In 2017, The Meredith Poll measure how North Carolina citizens felt about political polarization. Then, over three-quarters of North Carolinians felt that the country was more divided than in the past. However, in our most recent survey, only about one-third (35.1%) of North Carolinians feel this way today, while just under one-quarter (24.7%) feel that it is about the same. Rather than reflecting any change in the political polarization among political leaders or in media outlets, this new figure represents the normalization of polarization. People are now used to sharp partisan divides in the rhetoric of national and state political leaders. This normalization of polarization is also reflected in people’s views of whether the country will be more or less divided five years from now. About the same number of people feel we will be more divided (30.6%), as do those who think we will be less divided (33.4%) or who feel polarization will be about the same (23.8%). “Although political polarization has not improved, people’s perceptions of it have changed. North Carolinians are getting more used to polarization being the new normal in politics,” McLennan said. The Meredith Poll also asked voters if they believe a third political party is needed. Given voter perceptions that neither party reflects the needs of the people nor governs in an honest and ethical manner, it should be no surprise that North Carolinians think a viable third political party is needed. Less than one-in-five citizens (23.5%) feel that the two major parties do an adequate job, while a majority (56.7%) feel a third party is needed to improve government. A majority of Democrats (56.3%) and Republicans (51.3%) share this belief in the need for a third party in government, while over two thirds of unaffiliated voters (67.1%) want this option. North Carolinians continue to disapprove of most political figures and institutions after the Midterm Elections. President Donald Trump continues to be a polarizing figure with an overall approval rating of 38.2%. His approval with Democrats is 10.6%, but his approval with Republicans is a sturdy 86 percent. Among independents, Trump has a 34.4% approval rating, which may bode poorly as he enters the early phase of his reelection campaign. Trump continues to suffer from a gender gap in approval with 37.6% of women in North Carolina approving of his job performance, while just under hand of the men (49.2%) approve. “Donald Trump continues to be disliked by almost two-thirds of North Carolinians, although he enjoys consistently high support from Republicans. Since our poll was conducted as the Mueller Report was released and Attorney General Barr’s summary was issued, it does not appear as though the conclusions reached by Barr have affected Trump's approval ratings in North Carolina,” said McLennan. Governor Roy Cooper’s approval rating remains relatively strong in comparison to Trump and other groups, with 48.3% of respondents approving of his job performance percent. Almost 70% of Democrats (69.2%) approve of his job performance, while just 28.4% of Republicans do so. A slight majority of unaffiliated respondents approve of Cooper’s performance as governor. The approval for Republicans in Congress (31.9%) and the General Assembly (36.1%), as well as Democrats in Congress (38%) and the General Assembly (41.4%) are relatively unchanged since Meredith’s polls conducted last fall. Given recent decisions by President Trump to declare a national emergency along the southern border in order to shift federal funds to wall construction and to threaten to use the Justice Department to fight the Affordable Care Act, The Meredith Poll asked North Carolinians about whether they thought the president or Congress should have more power in governing. Only 22.2% of the respondents thought the president should have more power, while 57% thought Congress should have more power. No group had a majority of its respondents favor the president having more power. Democrats, however, had the largest percentage of its respondents favoring giving more power to Congress (74.9%), likely reflecting the recent takeover of control in the U.S. House of Representatives by Democrats. Only 34.7% of Republicans favored giving Congress more power than the president in governing. A large majority of unaffiliated respondents (60.9%) felt that Congress should have more power. 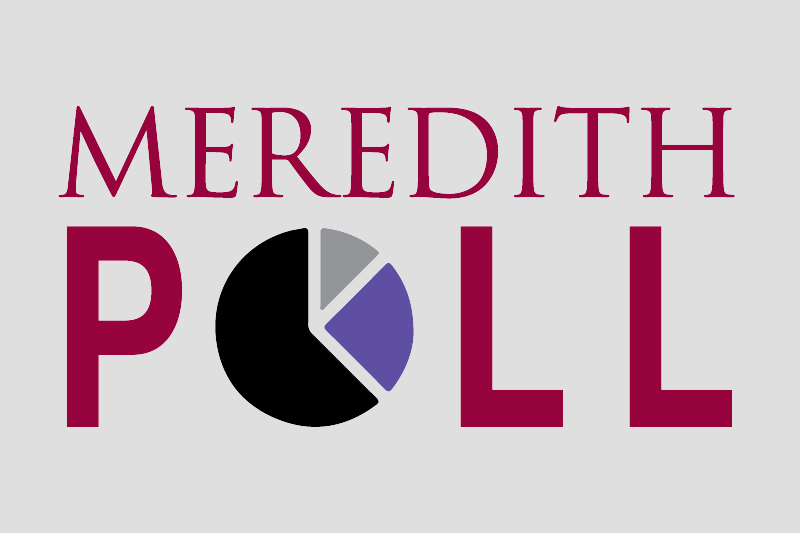 The Meredith Poll asked a variety of questions to understand North Carolinians’ perceptions of fairness and discrimination about education, political power, the opportunity to succeed, and wage gaps (racial and gender). By and large, the respondents thought the current economic and political systems were biased in favor of the wealthy, whites, and men. In terms of whether the education system gave all North Carolina children the same basic education, only 27.9% of the respondents thought it did, while 57.6% thought the education system favored certain groups. There was broad agreement about this gap, except in terms of party affiliation. Only 22.1% of Democrats thought all children got the same basic education, while 37.3% of Republicans and 31.5% of unaffiliated respondents agreed. On the issue of access to political power, over three quarters of those who responded (77.2%) think wealthy citizens have more access and power than do those at the lower ends of the economic scale. North Carolinians were almost evenly split on the question of whether racial and ethnic minorities had a fair opportunity to succeed with 38.2% thinking that the system was fair and allowed members of that group to succeed, while 40.9% consider the system stacked against racial and ethnic minorities. The greatest divide on this question had to do with political affiliation. Just over one-in-five Democrats (20.1%) think racial and ethnic minorities have the same opportunity to succeed as whites, but almost two-thirds of Republicans (65.3%) believe the opportunity is equal. Among those who do not affiliate with one of the major political parties, 42.9 percent think racial and ethnic minorities have equal opportunities for success. In today’s highly partisan environment, political rhetoric and debate can be rancorous. The perception from watching cable news programs is that conflict about politics is inevitable. The reality is that most North Carolinians do not like conflict and would rather avoid it. Almost three quarters of all respondents (71.5%) stated that they hated conflict with 61.8 percent stating that they feel upset after engaging in conflict. An equally large number of respondents (70.9%) stated they prefer to avoid conflict, including conflict over politics. Conflict avoidance is a nonpartisan issue with large majorities of Democrats (69.9%), Republicans (77.3%), and unaffiliated citizens (67.1%) stating they prefer to avoid conflict. Of the other demographic groups, only Millennials and those without a high school diploma were slightly less likely to avoid conflicts. A large majority of women (78.1%) indicated that they would prefer to avoid conflict, while smaller percentage of men (59.4%) stated they would avoid conflict. The Meredith College Poll conducted a mixed mode sample of registered North Carolina voters 217 live caller respondents and 463 email respondents (from March 24-April 1, 2019. The survey’s margin of error is +/-4%. Meredith College students administer the survey as part of the College’s commitment to civic engagement.